Opposition leader Michael Daley MP has promised Labor will spend $7 million on bike paths, building bike storage areas, and supporting road safety programs to make it easier for kids to walk and ride their bikes to school. 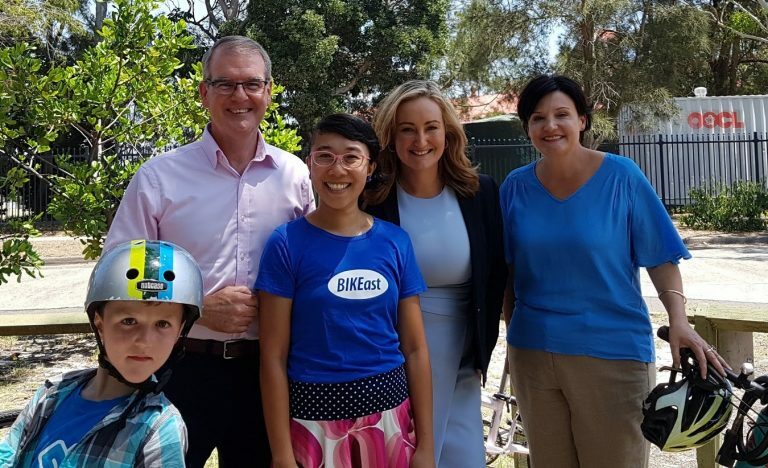 BIKEast and Bicycle NSW joined NSW Labor Leader Michael DaleyMP, Shadow Transport Minister Jodi McKay and Labor’s candidate for the seat of Coogee Marjorie O'Neill for the announcement of at South Coogee Public School on Sunday the 27th of January. Inactivity has skyrocketed over the past 40 years. In the 1970s, 80% of children walked or rode to school, but only 20% do today. behaviour change programs programs like the Bicycle Network’s Active Schools Program, which encourages kids to bike or walk to school. Mr Daley used to cycle to school himself and said active travel to school helped children focus better on learning compared to those who arrive by car. Jodi McKay MP pointed out that the initiative would benefit drivers by getting more cars off the road, and Ms O’Neill emphasised the benefits to the densely populated Coogee area of taking card off the road and making bike riding and walking more attractive alternatives. Bicycle NSW is pleased to see Labor supporting our key policies: Build it for Everyone, Safe Home and Invest Now for Health. This also supports calls by the Heart Foundation in NSW for funding for active travel to school. "We know policies that encourage and support children to ride bikes to school will help everyone," said General Manager of Public Affairs, Bastien Wallace. "It's great to see MP's and candidates working on policies that help children and families stay active and healthy, as well as reducing congestion in local communities," said Bastien. Check out the Labor media release for more details.